Offering you a complete choice of products which include industrial oil. 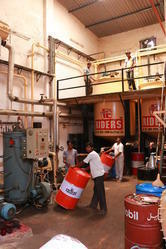 Tirupati Balaji Riders Oil Co. Private Limited is manufacturer and supplier of Industrial oil and fluid greases. Its products are manufactured in abidance to national & international standards and are applicable in construction and automobile industry. Our company manufactures a wide array of products which includes Automotive Transmission Fluids, General Purpose Calcium Grease, AP-LL 40000 Long Life Grease, Multi-Service AP-3 Grease, Genuine 4 Stroke Engine Oil, Pump Set Oil, Gear Oil and Metal Working Fluids.